By Beth Sergent - bsergent@aimmediamidwest. There were 260 meals served at the annual Community Thanksgiving Dinner hosted at the Point Pleasant Presbyterian Church on Tuesday. POINT PLEASANT — A day of Thanksgiving can came any day of the year. 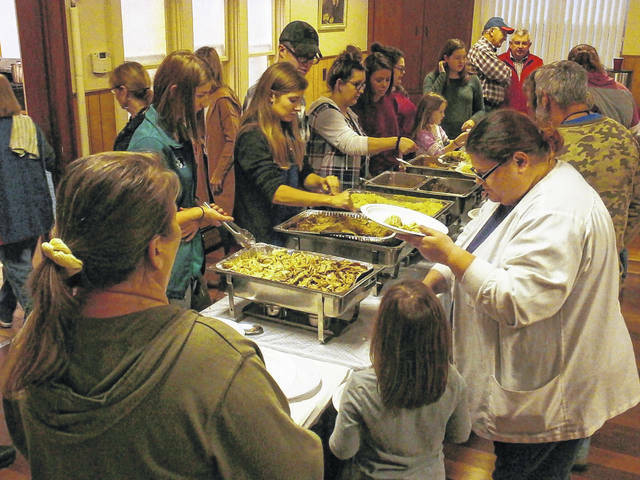 For several in Point Pleasant, that day fell on Tuesday of this week during the Presbyterian Church’s annual Community Thanksgiving Dinner. Only an hour into dinner service, over 100 plates had been served and 74 home-delivered meals had left the building. When all was said and done, 260 total meals were served and leftovers went to a family in need. Nothing was wasted. The church provided (and prepared) 14 turkeys which were 25 pounds each; mashed over 100 pounds of potatoes; prepared five extra large pans of dressing. In addition, corn and green beans, rolls, cranberry salad, desserts and drinks were offered. Church volunteers helped prepare and serve the meal with special serving assistance from members of the FFA group from the Mason County Career Center, including Brianna Haga, president, Miranda Payne, vice president, Gavin Frush, sentinel, Adriana Sharp, parliamentarian. Haga, who has been in FFA since her freshman year, has been helping with the dinner since joining FFA, along with several of her officers. Alyx Tench, 7, of Point Pleasant, who attends the church, was busy passing out cups of cranberry salad but earlier she and her family had delivered several meals to residents in the Twin Towers. Alyx said it had been a memorable day and she was definitely having “fun.” When asked what she’ll always remember about that day, she said, “mom spilled the gravy” during a Twin Towers delivery. The church also provided children who attended the dinner with a bag filled with various food items.